Hey, picture uploads to Blogger worked! Finally, some COLOR on my blog! I’ve been working on two new baby sweaters. The first one is ANOTHER baby tank, only this time I’ve used six colors instead of two. I didn’t really intend to make this but I have a billion itty bitty balls of KP Shine kicking around the bottom of my knitting bag so this is an attempt to clean up! I think it looks pretty good. We’ll see how it looks once I put the trim on. I’m a little skeptical of how a turquoise trim will look with the light blue top. Then again, *I* don’t have to wear it! No baby will care if the blues don’t look perfectly matched. The second little sweater is actually a project that two other women from my knitting group are working on. They saw a pattern in my Phildar Layette magazine that they liked and wanted to knit it. I’m helping out with the French knitting vocabulary so I thought I’d make the sweater so they’d have a model to look at. I used Lion Brand Cotton-Ease. I’ve clearly not woven in the ends. I also need to make a button hole at the back neck. While I like the look of the openwork pattern, I didn’t particularly find this pattern very enjoyable. Perhaps because I made the 3 mos. size, I felt like I always had to have the pattern on me, since there were lots of changes in the pattern once I reached the openwork. Finally, I thought I’d upload a couple of dog pictures. I figure that if my baby knit tank tops are boring you, the pups might jazz up the blog. 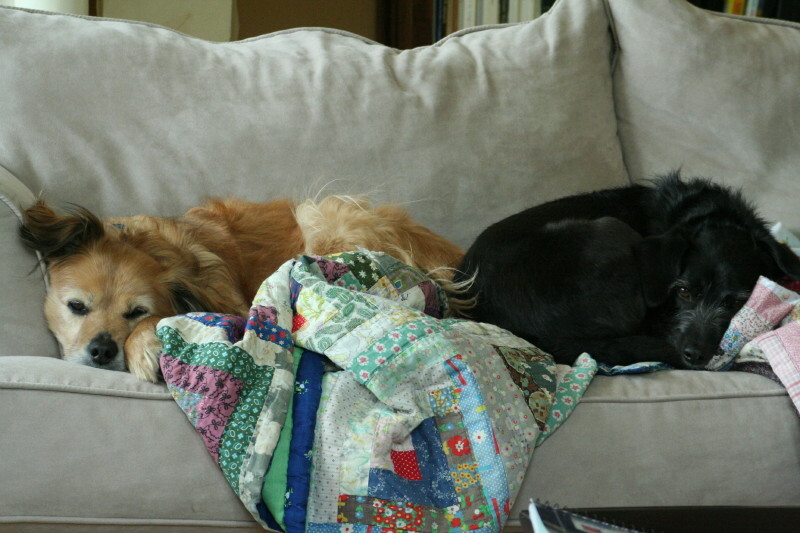 It’s really cold today so Jacques and Petunia are forced to sleep next to each other on the couch to stay warm. 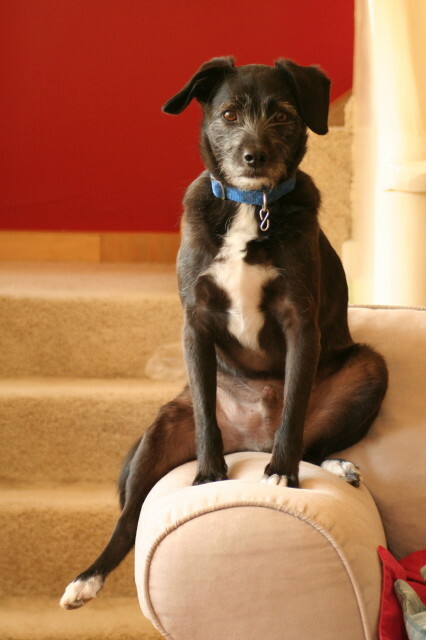 Jacques, the black dog, doesn’t have much hair so he shivers when the temperature drops below 70 dregrees. After wrestling with photos and Blogger, I’m thinking of hosting my blog elsewhere. I have lots of pictures to post but I keep getting Blogger timeout errors. Stay tuned for updates. There might be a URL change in my future. A million thank yous to my wonderful SP7, Jody!!!! She sent me a beautiful final package with skin cream, pretty sticky notes, a really cool pen that glows in the dar, candy and, of course, yarn. 🙂 🙂 I really enjoyed my first SP experience and I’m planning on joining SP8. I hope all of you SPers had a good time this round! I’m just going to link to the pictures I have on my Flickr account so I apologize for a boring text-only post. When I read blogs, I usually look at the pictures first and start reading only if a picture catches my eye. I know, that means I’m really shallow. Agreed. I’m a sucker for pictures. Over my spring break a few weeks ago, I made a bunch of maternity clothes and used up some fabric scraps for cloth diapers (more here and here). I found a pattern for an all-in-one diaper at One Stop Diaper Shop a few years ago when I was working on one for a cousin. I bought PUL waterproof fabric, birdseye cotton and flannel for the diapers and used fabric remnants for interesting exteriors. I’m really happy with how they turned out. I still have some finishing to do. I can’t decide if I want to use snaps or velcro. Any strong opinions out there in blogland? Also, I’ve put down a little baby cardigan (another view here) that I think is cute but I suspect the sleeves are too long. I put a lot of work into this because of those edges (gauge is 7sts/in on sz 4 – picking up all of those stitches was such a pain!) I don’t know if I can knit the second sleeve and sew the whole thing up. I need some distance from the project so I’ve put it down for now. Here is a finished newborn tank. 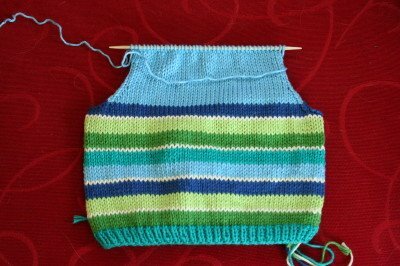 I might take the neckline out and add a button tab to make sure the neck hole is big enough for a newborn’s head. We’ll see. Finally, I’ve returned to one of my favorite patterns. It is so unbelievably simple but I just love it. It’s a garter stitch hooded jacket from Phildar Layette Fall 2004. I’m making it out of white Lion Brand Cotton-Ease and using seed stitch instead of garter stitch. I’ve been using up leftover balls of Knit Picks Shine from several recent projects. 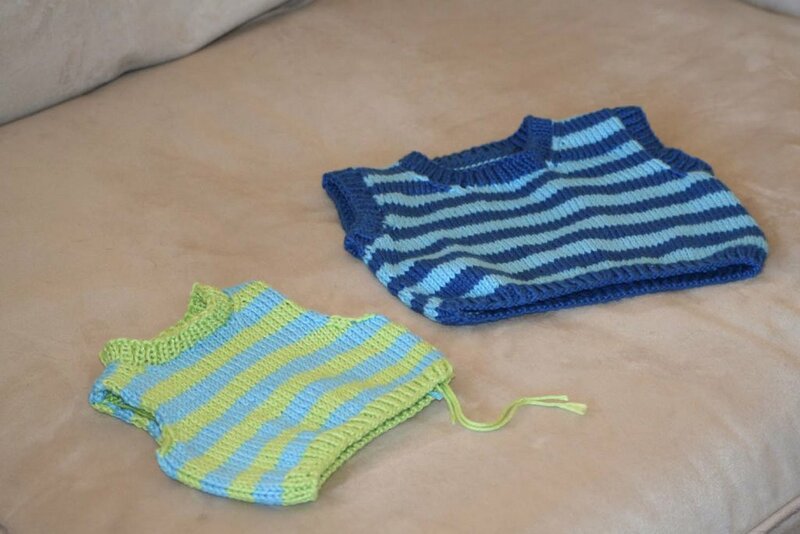 Last summer, I made a bunch of little striped baby tank tops. 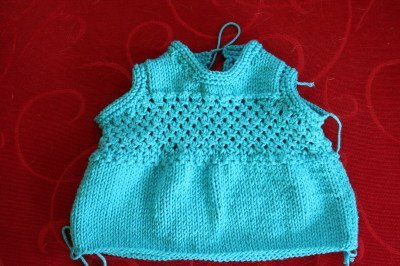 I used the tank top pattern in size 0-3 mos from Debbie Bliss’ Baby Knits book. Like all Debbie Bliss patterns, the sizing was way too big and the 0-3 mos size actually fits 6-9 mos. I’ve been meaning to adjust the pattern to fit a newborn, 0-3 mos, and 3-6 mos. I think a set of these tops in each size would be a really cool baby shower gift. They’ve been a big hit with recipients. 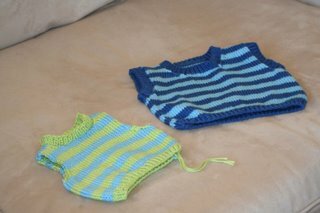 Here are the two tanks I knit up last week. 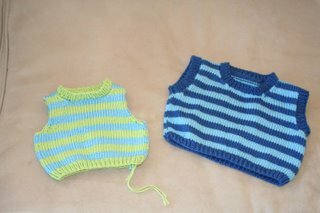 The blue one is the standard 6-9 mos size. The little one is for a newborn. For the blue one, I used KP Shine in River and Sky. The newborn sweater is made out of KP Shine Sky and Green Apple. I’m bent on using up the rest of these scraps. I have some Shine in Cream, Turquoise, River, Sky and Green Apple. Any ideas? I’ve thought of making hats to match but hat sizes can be so variable with babies. On the other hand, this yarn is pretty stretchy. I’d have to make a lot of hats to chew through my leftovers. I have about a full ball of each color and a little more of Sky. I’ve been coveting some Cascade 220 Superwash that is CHEAP on eBay (so go buy it knit bloggers – keep me away from it!) Back in December, I was so distressed by the amount of yarn I accumulated in under 6 weeks that I decided I’m not buying ANYTHING until the stash is reduced. This includes Cascade Superwash, which happens to be my most favorite yarn on the planet. At least, it is this week.